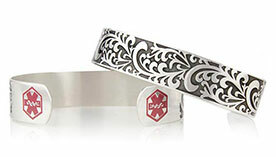 Choose the style you prefer, and we will engrave it with your contrast dye allergy and other pertinent information. Millions of people in the US undergo medical scans every year that require the use of contrast dye. This dye, also called iodine contrast or intravenous (IV) contrast dye, is very helpful in radiological studies including CAT scans, angiograms, X-rays, and some MRIs, providing clearer images of the structures doctors are trying to see. As with nearly any substance, there are people who have contrast dye allergies. Radiocontrast media allergies affect approximately 5 to 8% of recipients, with the majority of those affected experiencing mild nausea, vomiting, and/or localized sensations of warmth. More moderate reactions, impacting approximately 1% of dye recipients, include hives, swelling, and/or severe vomiting to the point of requiring medical treatment. Very severe reactions are rare, occurring on an estimated 0.1% of patients, and these include anaphylaxis. The different types of contrast material used by radiologists have varying rates of reaction among patients, but all reactions are noteworthy events and should be taken seriously. 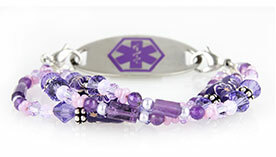 If you have an allergy to contrast dye, medical ID jewelry can save your life. A previous reaction to radiocontrast material makes you extremely likely to react again (and potentially more seriously) if exposed to contrast dye. Considering contrast dye is used in radiological scans, which are common emergency room tools (X-rays, MRIs, CAT scans), it is very likely that, in the event of an accident, you would be exposed to this allergen. 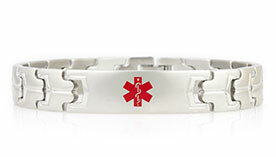 That means, in addition to any injuries you’ve sustained, you would also then suffer an unnecessary allergic reaction. 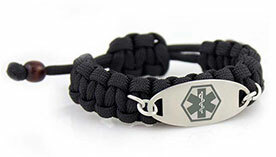 However, if you were wearing a medical ID necklace or bracelet, medical staff would know not to use this material, and they would also have access to your name, emergency contact information, and any other allergies or conditions you choose to list on your medical ID.